June Comedy Dates are Here! Summer is almost here, and we are excited for some great comedy festivals! Ted Alexandro at a benefit in NYC, Jim Jeffries in Denver and Austin, Dan Soder, Ari Shaffir at the Stand NYC midweek! Legion of Skanks is every Tuesday night at The Creek and the Cave, Rich Vos in Buffalo, Nick DiPaolo in Tampa, Jim Florentine is in Portland, OR with Eddie Trunk then Seattle. Doug Benson and Michael Che is in Bloomington IN for the Limestone Comedy Festival. Reverend Bob Levy in Hackettstown NJ. May 21-24 2015 Comedy Calendar- Memorial Day Weekend! Adam Ferrara and Joe Currie at Governor’s Levittown, NY. More info here. Amy Schumer at Route 66, Albuquerque, NM. Tickets on her site here. Rich Vos at Gotham Comedy Club, NYC. More info here. Thackerville, OK. Tickets on her site here. ***SOLD OUT ACCORDING TO TICKETMASTER BUT SAID TO CHECK CLOSER TO VENUE DATE??? Hannibal Buress at Tulalip Resort Casino, Tulalip WA. More info here. Joe DeRosa at Flappers Comedy Club in Burbank, CA More info here. Rich Vos and Bonnie McFarlane at RR Raz Room, New Hope, PA. More info here. Comedy fans of #Bennington, O&J, Legion of Skanks, etc., we are curating where our favorite comedians are going to be each weekend. Rather than google endlessly, we wanted to make it easier for people to find a place to laugh. Missing someone? Comment below WITH THE VENUE and DATE if we are missing favorites for this weekend. So far these include: Jim Norton, Tom Papa, Sherrod Small, Keith Robinson, Rich Vos, Bonnie MacFarlane, Bill Burr, Esther Ku, Vic Henley, Jim Jefferies, Kurt Metzger, Big Jay Oakerson, Dave Attell, Bobby Kelly, Jim Gaffigan, Greer Barnes, Hannibal Buress, Amy Schumer, Brian Regan, Rev Bob Levy, Jim Florentine. If they don’t have something on their site, you won’t see them on this weekend’s list, if we missed a tweet about a new performance, LET US KNOW! Check out Bobby Kelly this weekend at Laugh Boston Thursday-Saturday May 14-16, 2015. 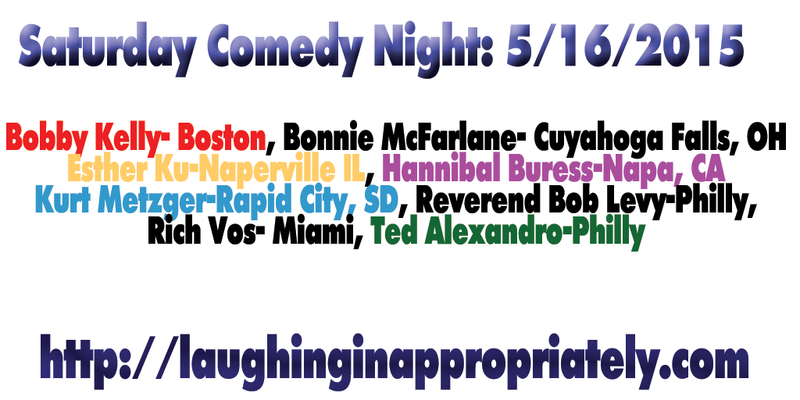 Vos will be in Miami, while his long suffering wife, Bonnie McFarlane will be in Cuyahoga Falls, OH, hopefully having an affair. Just kidding! What do you expect with a podcast called “My Wife Hates Me”? No one reads this anyway. Check out all our favorites’ gigs below. And share with a friend!